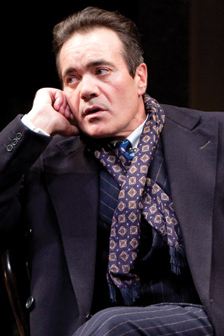 Photo of Derek Smith in STC's 2011 production of 'The Merchant of Venice' by Scott Suchman. Ethan McSweeny: Derek, we just worked together last season on The Merchant of Venice. You hadn’t played Benedick before. Derek Smith: Yes. In fact, this is the first Shakespeare I’ve ever done in prose. Which really intimidated me at first. But I’m amazed to find how much rhythm there is in it. I didn’t think there would be, and I didn’t think it would be possible to memorize, but I was wrong. It’s very rhythmic. And I love the fact that it’s so fresh to me. I have never seen this play, you know. For some reason, I don’t even think I saw the movie. But I love middle-aged love stories. Nobody writes them any more. EM: It depends on how you define middle. (Laughter.) It seems like we’re leaning toward versions of these characters that have lived lives already. DS: I think both Beatrice and Benedick have lived long enough to have put up a lot of walls. DS: Well, Shakespeare writes so wonderfully about these layers of denial, in so many plays and with so many characters. He does it in a way that is unparalleled. The human mind, operating on 12 different wavelengths at once, having many thoughts at the same time, and choosing which ones you can actually face in the moment. DS: It’s hard. You get to be an age where you see the potential for something and you have to really resist all the reasons why this probably won’t work. You know, you lose that kind of innocence. There are also those gulling scenes, the way Beatrice and Benedick both hear how they’re perceived by others. There are some horrible truths that they both have to hear. EM: The truth is always horrible. In the second half there are much more substantial scenes between Beatrice and Benedick. In the first half of the play, they spend more time talking about one another than they spend talking to one another, which is revealing. And in the second half Benedick shifts over to the other group, which is a really big deal. He leaves this very male-centered, male-bonded world and comes into this much more feminized world of Beatrice and Hero and Messina, and even Leonato and Antonio. Ultimately, everybody, I think, wants Beatrice and Benedick to figure this out and get together. Even Beatrice and Benedick want it, they just don’t know how to do it without sacrificing who they have become, without losing their status. EM: I think it’s directly motivated by what they’ve just been through. It’s London in the Blitz, and suddenly they move quicker, into larger ideas then they were prepared to earlier. Another thing that sticks out to me is that these are the only of Shakespeare’s lovers who seem to know each other before the play begins. And that’s what’s grown up about it. It’s not idealized romantic love. EM: That’s what we mean when we talk about this play being really grown up. It’s love but it’s not blind. It’s aware. It does see the end and it knows that love is hard and that mistakes will be made and people will get hurt and they go into it anyway. DS: I agree. They go into it knowing each other and they come to know a lot about themselves. They really learn a lot about themselves over the course of the play. And by the end they go into this relationship with incredible knowledge and this kind of generosity. I think Benedick is a much more generous man at the end than he is when he begins the play. EM: You know, Derek, you talk about the play being written in prose…it’s a surprisingly naturalistic play for Shakespeare. It’s more domestic and natural than so many of his plays. There’s no magic in this play. Zippo. I mean, not a moment of it, not even a Friar with a potion, like in Romeo and Juliet. I think that’s why I wanted to set it in a rural place. It’s not a world of super fancy people. It’s a rural hacienda. It’s not this story of, you know, fancy aristos, running around. It’s a play about very human characters with very real flaws who come to learn some very real things about themselves.